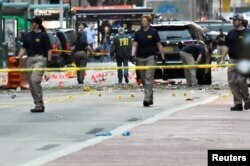 FILE - Members of the FBI and other law enforcement officers carry on investigations at the scene of Saturday's explosion in New York, Sept. 18, 2016. After the Orlando, Florida, nightclub shooting in June, many Afghan-Americans distanced themselves from attacker Omar Mateen, the New York-born man whose parents immigrated from Afghanistan in the 1980s. After the weekend bombings in New York and New Jersey in which Afghan-born Ahmad Khan Rahami has been implicated, some say they can no longer maintain the fiction that the perpetrator is not one of their own. "We can't just say he's not part of us," said Manizhah Naderi, a community leader and a member of Masjid Dar al-Taqwa, an Afghan-American mosque in Flushing, Queens — home to one of the original Afghan immigrant communities in America. "We have to take responsibility somehow that he is an Afghan-American, and how can we make sure that others in the community don't get radicalized." A still image captured from a video from WABC television shows a conscious man believed to be New York bombing suspect Ahmad Khan Rahami being loaded into an ambulance after a shoot-out with police in Linden, New Jersey, Sept. 19, 2016. Rahami, 28, was apprehended Monday morning after a shootout with police in Linden, New Jersey — six kilometers from Elizabeth, New Jersey, where he lived and worked at his family-owned First American Fried Chicken restaurant. New York City Mayor Bill de Blasio said Rahami is the only person believed to be involved in the New York and New Jersey blasts. At least 29 people were injured in the New York explosion. Akbar Sherzad, the imam of Masjid Dar al-Taqwa who lives in the nearby town of Somerset, New Jersey, said he talked to several Afghans in New Jersey, and no one in the community seemed to have heard of the Rahamis. Sherzad condemned the bombings, saying they had shaken up the Afghan-American community of greater New York, with an estimated 30,000 to 50,000 members. "Now that these incidents have been repeated, I hope we can step up our efforts to engage the families to prevent such incidents in the future," he said in a phone interview. While some Muslim-American youth have become radicalized through their association with mosques, Sherzad said the problem lies outside the community. "Unfortunately, children of families that are distant from their communities and mosques have become victims" of radicalization, he said. "The children make contacts with the [extremist] groups at work or in college without the knowledge of their families." A person at Dar ul-Islam mosque in Elizabeth — which counts many Afghans among its members — said Rahami was not a congregant. The New York Times reported that Rahami became religious after a trip to his native Afghanistan four years ago, and he prayed in the back of his family's store. Imams at Afghan-American mosques in New York and Virginia, with large immigrant communities from Afghanistan, say they run youth engagement programs and warn their congregants during Friday services against extremist encroachments in their midst. "Those individuals that are, unfortunately, brainwashed and radicalized, their families have to be very careful," said Mohammad Nader Hussaini, head of the Mustafa Center, an Afghan-American mosque in Annandale, Virginia. FILE - Federal Bureau of Investigation officials walk past evidence markers near the site of an explosion in the Chelsea neighborhood of Manhattan, New York, Sept. 18, 2016. To prevent "such incidents," Imam Sherzad said, the Dar al-Taqwa in New York last year launched monthly "family evenings" where families and youth come to discuss extremism. "We'd listen to them," Sherzad said. "We'd observe them and we'd counsel them lest they become victims of groups that are trying to brainwash them. We tell families to be vigilant about what kind of people their children interact with." Still, he said, mosques need to do more to rein in radicalization, adding that he plans to convene his mosque's board and meet with other local religious leaders "to do something jointly." Meanwhile, fear of a violent public backlash against the Afghan-American and the larger Muslim community runs high, with imams and community leaders advising members to keep a low profile in the coming days. "We're definitely cautious," Naderi said. "We've told the community to stay cautious, to stay away from the streets for a few days until this dies down."